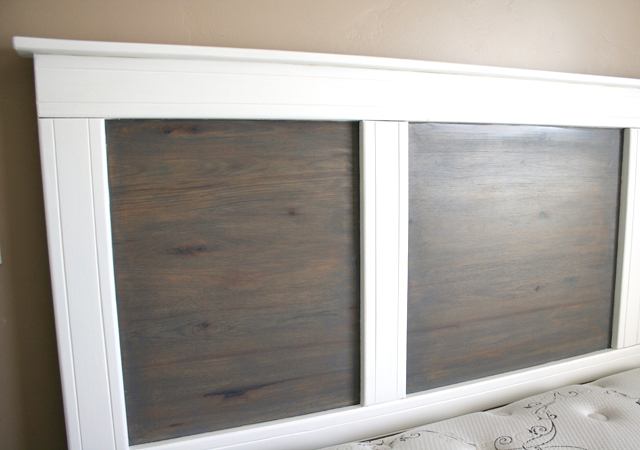 Here’s a little back story on this headboard. My awesome husband and I have been married 7 1/2 years. We’ve NEVER had a very cute or decorated master bedroom. 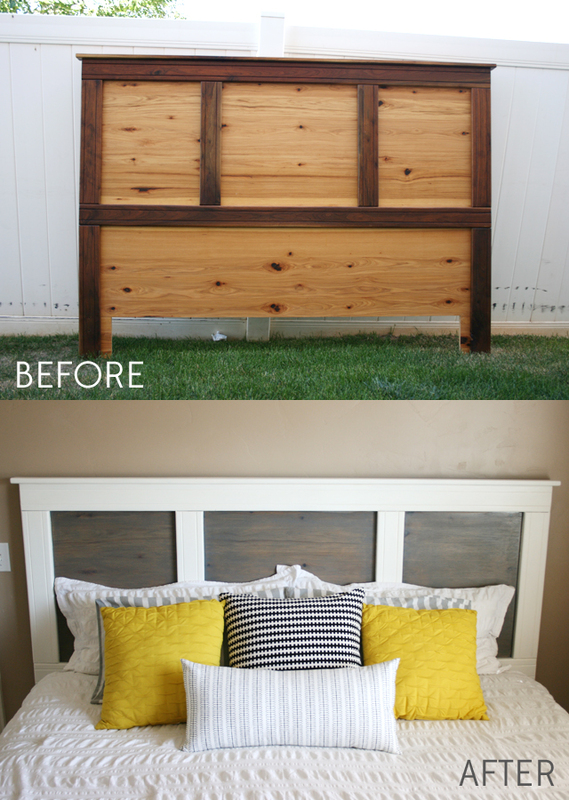 A headboard has been on my list of wants for many many years, I just couldn’t stomach buying a new one and hadn’t found anything I like on Craigslist and the like. Then I found this beauty one day on our local Facebook “yard sale” page and knew it would be perfect for a makeover! Originally $75, I talked the lady down to 50 and we went and picked it up, got caught in a huge surprise downpour and came home soaked but excited! Then….it sat in all it’s ugliness for 2 months. 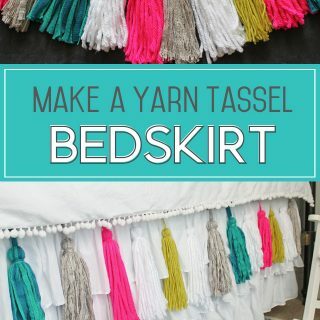 So I’m excited to share with you all how we finally transformed this thrifted headboard into something that fits the clean and modern look I want for our bedroom! 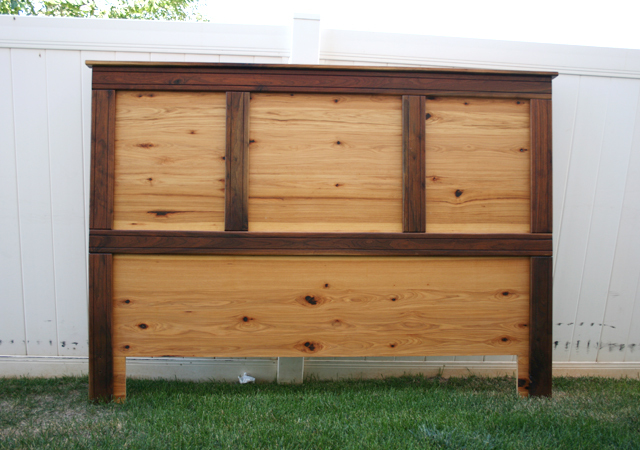 I wanted a stain/paint combination look, so we had to sand down the three inner panels before applying stain. Holy cow, it took FOR. EV. ER. I’m so thankful the hubs was on board to help! Then we used Minwax Wood Finish stain in Classic Grey (found at Home Depot) It took a few coats to get it the desired shade, but I am happy with the final look! Luckily we could leave that bottom panel since it would be covered by the bed. After all that sanding on the inside panels, I was SO excited to not even have to THINK about sanding before painting all the white trim. Seriously, I would have given up and junked the whole project! I literally did nothing to prep the surface except wipe off the dust from sanding. 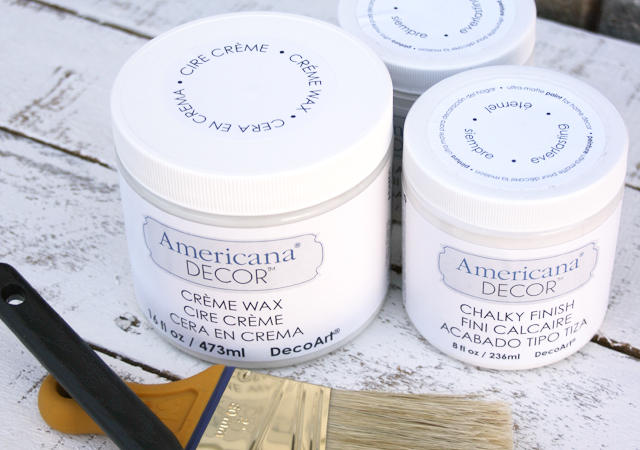 I used the Americana Decor Chalky Finish Paint in Everlasting and the Clear Creme Wax as the final step to protect the paint. 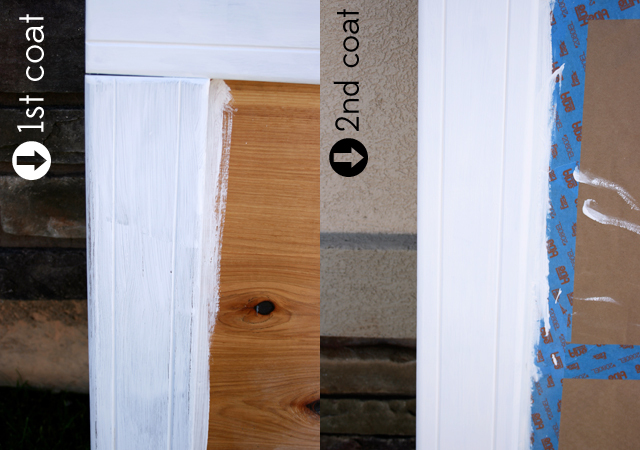 Here are some photos of the first and second coats of paint so you can get an idea of the coverage. For such a dark wood, I was thrilled with how nicely the Chalky Finish Paint was covering after only 2 coats! The paint dries quickly and I love that I could wash my brush easily with soap and warm water in between. In the end I did 3-4 coats (last one just being touch-ups) to get the full coverage I was looking for. 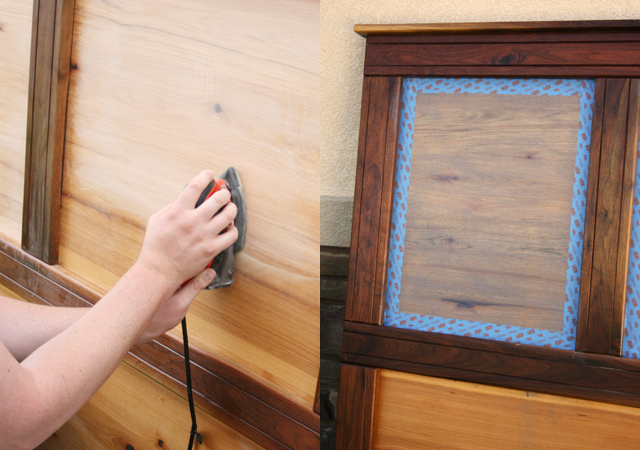 You can do a light sanding in between coats, also – which I did for those couple drops and globby messes I had missed! The paint is really forgiving! 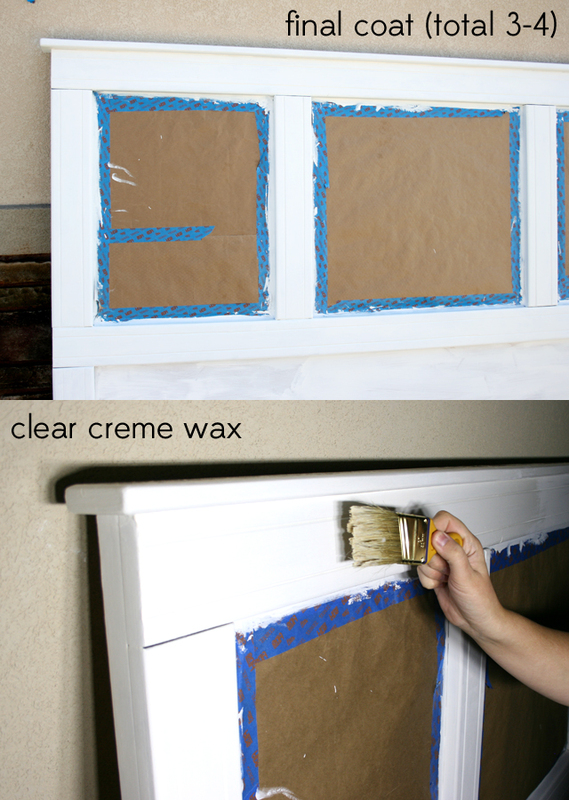 Here’s where you could also get that great distressed look by sanding corners and edges if that’s what you want. After a minor setback with the painters tape removing a little bit of my gorgeous stain, I finished up the headboard and put it back in our room. I love the new, clean look! 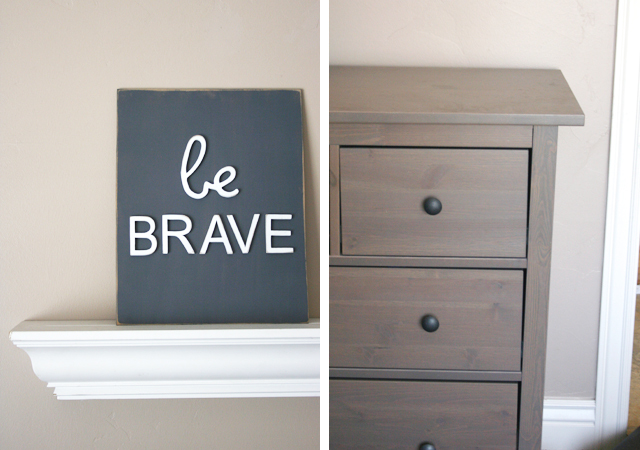 The gray matches my IKEA gray-stained dresser and other pieces so well! 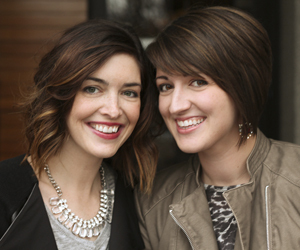 Here’s one more look at the transformation! I’m thrilled with how it turned out (even with some bumps along the way) and I can’t wait to use the Chalky Finish Paint on another piece of furniture that’s been dying for a makeover! Ready to try it out for yoursefl? 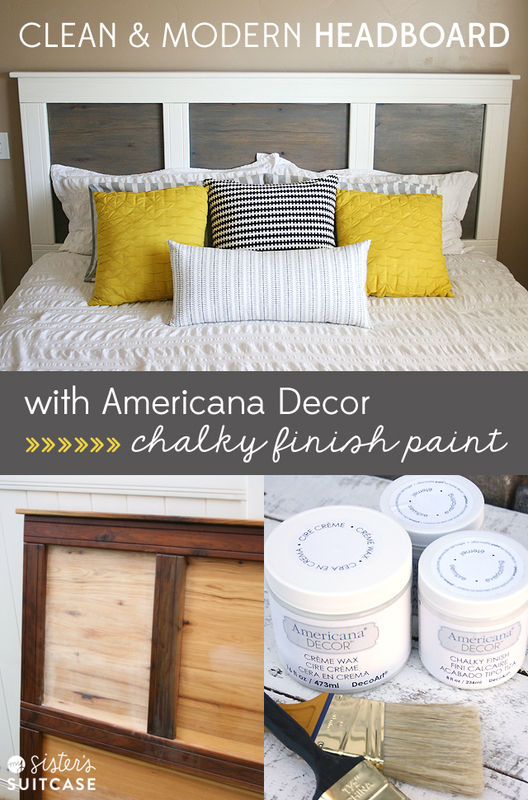 Americana Decor Chalky Finish paint is available in Home Depot, Hobby Lobby, Michaels, A.C. Moore and other stores. 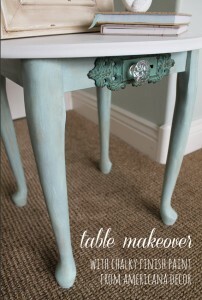 Visit the DecoArt Chalky Finish website for more chalk paint ideas and inspiration. 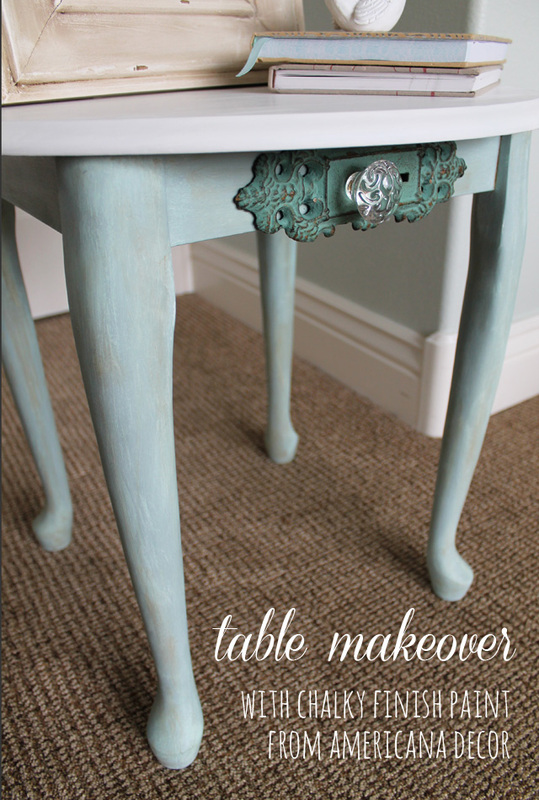 Here’s a great table makeover my Sis did using the same paint! I love the headboard!! 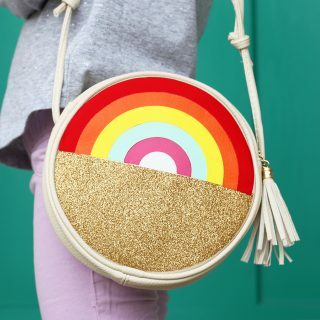 Love the colors especially!! Love how this pops out at you! Great job. Nat! First of all, I am so proud of you for doing a home decor post! Second, this looks AWESOME! Nat I love your headboard! Seriously beautiful and classy. Will you decorate my house? 🙂 You had great vision and this looks awesome. Ok, I’ve come back to look at this headboard like 12 times and I keep forgetting to comment. I seriously LOVE this! That sounded like a ton of work though. Maybe I’ll hire you to come do one for me. Haha, after you have the baby of course. 🙂 Good job Nat! I knew you had it in you! Gorgeous! Love it so much. Hi. I know this is an old post but hoping you’ll see my comment & help me. I did my creme wax on my coffee table peice already but now realize I’d like another coat of paint. Can I paint right over it..?